Elevator monitoring & diagnostics, even for older elevators. Wide range of communication options and new, server-based solutions for web access & mobile applications. Robust, solid-state electronics and RTOS (real-time operating system) with multiple fail-safe mechanisms. We’ve seen amazing technological leaps and exciting new products introduced into our world over the last decades. However, some industries and devices have not changed for many years. Escalade is targeting industrial segments and applications and creating state-of-the-art IoT solutions based on embedded solutions and connected services. In the world of elevators, control panel technology has remained static. In most cases, the control panel for each elevator is individually built, specially ordered to meet the specific characteristics of each building. Once this type of control panel is installed, it’s difficult, if not impossible, to add additional features to the elevator. To address this need Escalade developed the iCEP, the world’s most comprehensive platform for connected applications in the elevator market. Escalade is also focusing on advanced multimedia systems and is partnering with leaders in media/content generation & advertising in order to bring unique benefits and features to multimedia systems. 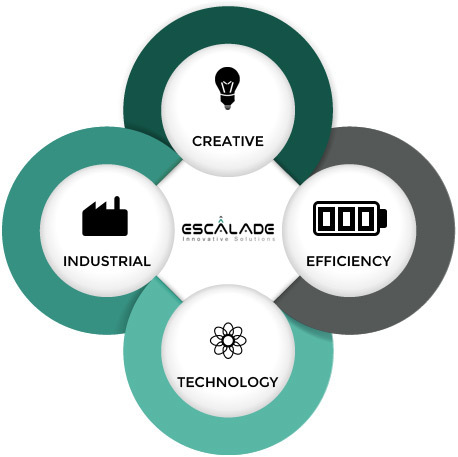 Escalade, founded in 2011, brings innovation, creativity and efficiency to industrial markets that can benefit from new technologies. The company develops products & solutions that address existing and future needs. Our vision is to become a world leader in products, services and applications for connected and smart devices. With millions of elevators throughout the world requiring modernization, and a strong need for new products to match the demand for new elevator systems, Escalade is focusing on elevators as one of its first targeted markets. The Escalade team consists of highly experienced engineers and executives from high-tech companies. We have vast know-how and a proven track record in designing, producing and selling secure embedded solutions, mobile & wireless applications and other products for a variety of industrial, financial & commercial industries. We have vast experience in project management and manufacturing – those capabilities allow us to tailor solutions for any customer needs. Please contact us for a demo or more information. Copyright © 2019 - i-Escalade. Website development by New Edge Design.